As the upgrade to our popular Envision product line, the 5 Series® carries some of our best features and efficiencies. Its advanced components offer a level of comfort and savings that’s far greater than any ordinary system and represents the industry’s highest efficiency two-stage unit at 30 EER and 4.8 COP. 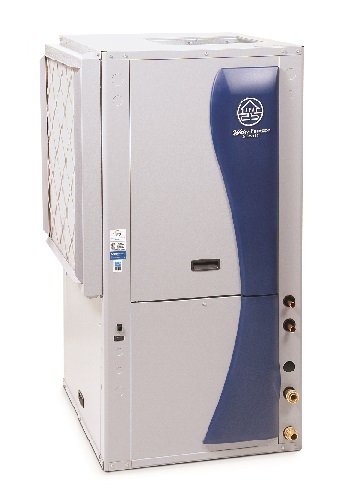 The 500A11 carries the Energy Star Most Efficient 2015 designation and was developed in the HVAC industry’s only in-house Energy Star Recognized Laboratory. It provides forced air heating, air conditioning, and even generates a portion of your home’s hot water—all from a single unit. Replace your fossil fuel furnace and noisy outdoor air conditioner with a system that uses the earth as its fuel source. 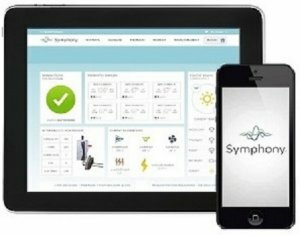 The Symphony system, by WaterFurnace, is a complete system monitoring package that internet enables the entire unit, giving you access to all the data you need, where ever you need it, to not only control, but monitor and troubleshoot your WaterFurnace. Symphony is cloud-based, so there’s no software to install and provides control over your entire geothermal system - not just the thermostat as in other ‘smart thermostat’ systems. Cabinet: The cabinet comes standard with a professional grade finish for long-lasting beauty and protection. Hot Water Generation: With an optional hot water assist, the 5 Series preheats your water and delivers it to your water heater. Coated Air Coil: Our exclusive FormiShield Plus coating on the air coil resists corrosion and increases equipment life. Its large size improves efficiency and dehumidifciation during cooling. IntelliStart: This optional soft starter reduces start-up amperage by up to 60% of normal draw to reduce noise, eliminate light flicker, and increase compressor life. ThermaShield: Our exclusive coaxial heat exchanger coating protects against condensation for temperatures below 50°F, extending its life. Compressor: For superb efficiency and reliability dual capacity units utilize Scroll UltraTech compressors. while Copeland Scroll compressors are featured in the single speed units. Rotary compressors are used in models 012 and 018. All compressors are mounted on double isolation plates for extra quiet operation. Controls: Sophisticated Aurora controls provide two way communication with components for the ultimate performance and troubleshooting capabilities. Blow Motor: A variable speed ECM motor runs at only the speed needed for maximum efficiency and savings. Other choices include a standard PSC or high efficiency X13 blower motor motor for comfort and quiet operation. Filter and Filter Rack: Pleated MERV 11 filter is standard while an optional pleasted MERV 13 is available for improved air quality. Filter rack holds 1" or 2" filters and is field convertible.